At times funny, clever and even touching, but the film’s tempo and blatantly obvious metaphors makes it an overall dull experience. Muchos kitsches und clichéjos, but hella good. a very good movie about PTSD and how the victims suffer from it and how art can help them survive and get back to normal life. It might not be great. Perhaps not. I don't know. It's disjointed for sure and I'm not sure if it wants to be a fantasy or a drama... or both. It hasn't decided. But it provides an accurate and emotional depiction of PTSD. 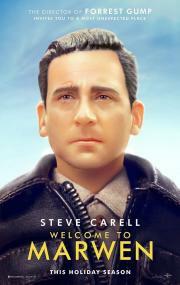 Steve Carrell gives a powerhouse performance. It's fascinating to watch unfold and all the loose ends tie themselves up in the ways they should. It may not be great, but it's absolutely effective and a satisfying joy to watch. It’s all about the heels. In the original story, heels are about a triumph of art over adversity. Of self-discovery over self-defeat. Here, it’s like, great bro. Cool Instagram. Zemeckis throws a lot of technology at his main character, but I don’t think he understands him at all.